Not in Our Neighborhood: Crain’s reports that Brooklyn Bridge Park neighbors are up in arms over a proposal to build a 16-story residential building within the park, which could include affordable housing. Etsy Seeking a New Space: The e-commerce site may be expanding in Dumbo. Crain’s NY has the details. The Steepest and Cheapest: The Real Deal breaks down the most expensive and least expensive listings in the city… or as some of us see it, what we wish for… and what we can actually afford. 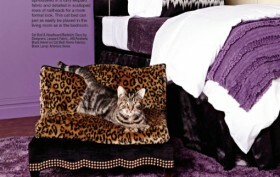 Designer Cat Beds Up for Auction: Check out Garfield’s new favorite digs with Editor At Large’s feline fierce feature. Ask Real Estate: The New York Times’s Ask Real Estate answers questions about open house etiquette and more. House Made of Bioconcrete Turns Rain into Drinking Water: This article on Fast Company’s website explores a house that becomes a water filter whenever it rains. Groundswell Unveils Greenpoint Mural: The Brownstoner gives us more details about this mural painted by teen artists.